Qiagen plans to acquire diagnostics developer STAT-Dx for up to $191 million, the companies said, in a deal designed to facilitate the buyer's planned launch later this year of a multiplex platform that will combine its chemistries with the acquired company's system based on real-time PCR technology in order to enable molecular analysis of common syndromes. The QIAstat-Dx platform is a system based on STAT-Dx’s proprietary DiagCORE technology, and is designed to enable scalable end-to-end or “sample to insight” processing of up to 48 molecular targets simultaneously, with the goal of diagnosing syndromes such as serious respiratory or gastrointestinal infections, as well as for use in oncology. Qiagen said the system can provide qualitative as well as quantitative insights into the precise cause of various syndromes in about one hour, using cost-efficient, easy-to-use assays suitable for any clinical sample type. The first two QIAstat-Dx tests to be released will be respiratory and gastrointestinal (GI) panels, Qiagen said. They are set to be launched in Europe in the second half of 2018, in the U.S. in 2019 following regulatory clearance, and in other markets worldwide based on their regulatory timelines. Qiagen projects a total market for respiratory syndromes and flu testing of about 1.5 million tests per year in the U.S. and 1.1 million in Europe. For GI syndromes, the company estimated the number of panels currently being run at 2.6 million per year in the U.S. and about 2 million in Europe. Additional tests are in development that span infectious diseases, immune response monitoring, oncology and companion diagnostics, Qiagen added. 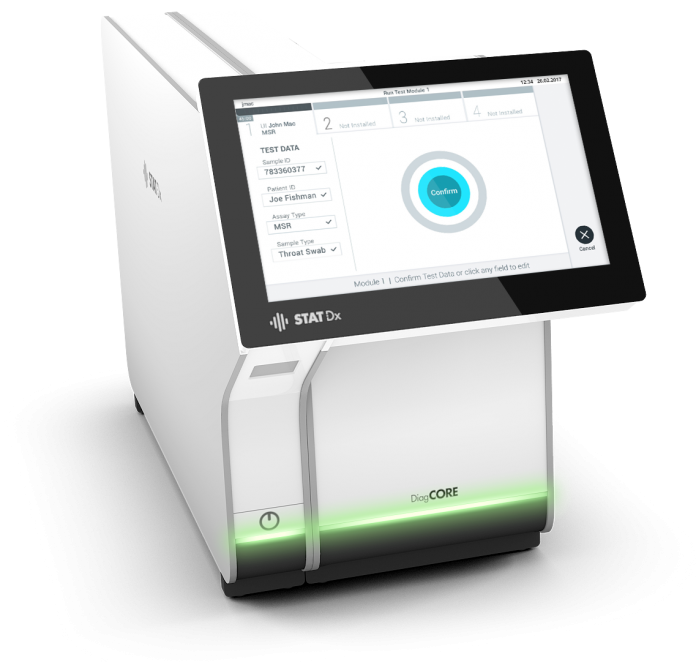 QIAstat-Dx was unveiled in April 2017 at the European Congress of Clinical Microbiology (ECCMID) and received a first CE-IVD marking in January 2018. Sample processing: The ability to process numerous challenging samples, including tissue samples in pathology, liquid samples or difficult-to-handle sputum samples in infectious disease with direct onboard swab processing. Customizable reporting: Selective analysis and reporting of tested molecular targets, rather than rigid panel designs requiring co-processing of irrelevant molecular targets, which the company says may complicate reimbursement. Assay cartridges: The platform uses assay cartridges that cost “significantly” less to manufacture than other systems, Qiagen said. Cartridges are processed in a scalable, proprietary and fully integrated platform that can be configured from one to eight modules, independently running cartridges with predefined assay protocols and managed via a touchscreen. Founded in 2010, STAT-Dx is based in Barcelona, Spain, and backed by a consortium of international healthcare investors that include Kurma Partners, Idinvest Partners, Gilde Healthcare Ysios Capital, Boehringer Ingelheim Venture Fund, Caixa Capital Risc and Axis. “At the closing of the transaction, we will build on the achievements of our fantastic team in developing a best-in-class system and leverage Qiagen’s resources with extensive R&D and commercial reach around the world,” added Jordi Carrera, co-founder and CEO of STAT-Dx. Qiagen said its acquisition of STAT-Dx is expected to close in the second quarter. Qiagen agreed to acquire all shares of STAT-Dx for $147 million cash, and pay up to an additional $44 million tied to achieving regulatory and commercial milestones. The acquisition would be funded from existing cash reserves. In releasing fourth-quarter 2017 results yesterday, Qiagen reported cash and cash equivalents of $657.7 million as of December 31, 2017, up nearly 50% from $439.2 million as of December 31, 2016. Qiagen finished Q4 with a net loss of $39.7 million, which the company said reflected an after-tax charge of $104.4 million primarily due to the U.S. tax overhaul enacted in December by President Donald J. Trump. Approximately $94.9 million of the charge involved non-cash items that resulted from the revaluation of deferred taxes and other tax provisions. Excluding the charge, Qiagen said, it finished Q4 with adjusted net income was $100.1 million, up 7% from $93.5 million a year earlier.